22 December 2009, at 8:42a.m. 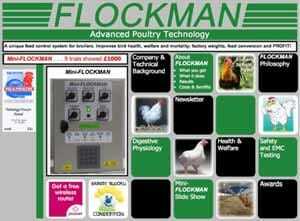 UK - The latest version of Mini-Flockman offers broiler farm managers better control of birds' daily feed intake. Chicken farmers are breaking records for feed efficiency with FCRs in the 1.5s for 35-day, and in the 1.6s for 42-day A/H broilers. These are at least two to five points better than the breed targets. Results are from farms using the Mini-Flockman system. This innovative system superseded Flockman in March 2008. During 2009, feedback from overseas and large integrator's R&D sites growing heavier birds led to further changes and field trials, which resulted in a complete revision of the software. This latest version of Mini-Flockman now enables site managers to control their birds' daily feed intake the same way that cattle farmers do. Trials have shown that on average payback is in two crops with a 95 per cent certainty of pay-back within three crops. Nearly 100 systems are now on farms in the south-west of the UK as well as abroad including New Zealand and China. The system is now being advertised for the first time on the Internet. David Filmer said: "The system owes much to practical experience and feedback from growers worldwide and we hope it contributes to a better use of scarce and expensive feed resources, whilst improving bird health and welfare, and cutting mortality, leg problems and factory rejects." The home page of the new web site, www.flockman.com, is shown below. For further information, contact David Filmer (email: david@flockman.com or telephone +44 (0) 7802 200 760) or click here.